For the black version: hat to edge, Cape made of Black jersey fabric and grey and blue line. Hat that could be compared to slap a hat, foldable, unworn, it has the volume of a cake. It fits a head circumference between 55-57 cm. You can wear it at many occasions, wedding, cocktail, daily or as a gift for a loved one suggestion. 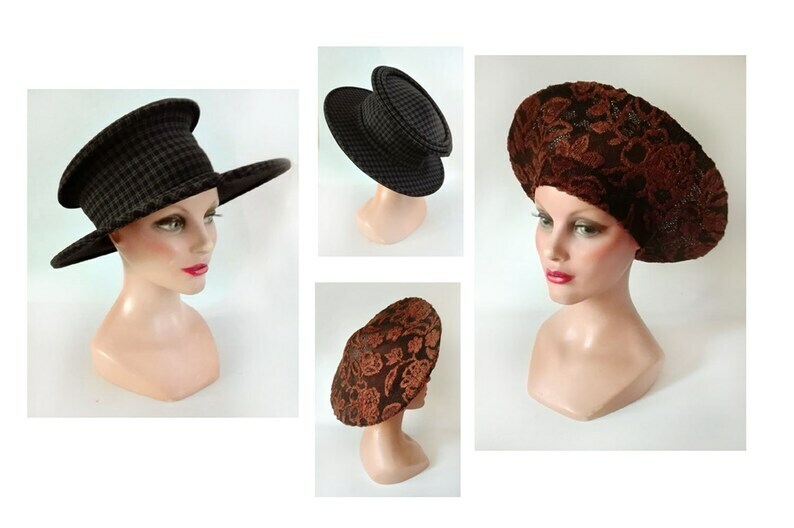 The hat is made of floral jersey fabrics in shades of Brown. Hat for formal or for other occasions that could be compared to a hat snaps, foldable, unworn hat has the volume of a cake. It fits a head circumference between 55-57 cm. Shipping is done in tracking envelope unless specification on your part of a mode of shipping that is unique.